Scholl Velvet Smooth Electronic Foot File + Serum 2 pieces order online. Gentle on your feet and easy to use, the Velvet Smooth Express Pedi can give you soft, silky feet in no time at all. The Velvet Smooth Express Pedi is an electronic foot file designed to remove hard skin for beautifully smooth skin after just 1 use. The Velvet Smooth Express Pedi buffs away hard skin in minutes leaving you with fabulous feet that you'll want to show off. It has an ergonomically shaped head for comfortable use. The specially designed micralumina roller head makes it quick and easy to remove tough, lifeless skin by exfoliating the foot through a gentle and safe rotating action. Remember – skin on your feet is 20X thicker than on the rest of your body so you really do need that “something special” for your feet. Battery of the electronic device with anti-slip grip. Head including patented microalumina microparticles. Operates on batteries, included in the package. The Velvet Smooth ™ Moisturizing serum for each day is special designed for feet with dry skin which needs care and intense hydration every day. The formula contains Hyaluronic Acid, Pentavitin ™ and green caviar. Hyaluronic acid is known for its ability to retain water better than any other ingredient. Pentavitin ™ binds to the keratin in the skin, which protects the natural moisture of the skin. These high-quality ingredients ensure visible results. 2. Ensure that the roller head is securel inserted into the unit. Do not use without the roller head attached. 3. Turn on the unit by twisting the silver ring to the left and gently glide the roller head over the hard skin. The dead skin will gradually exfoliate. Use only on dry skin. Do not press too hard or the unit will stop. 4. Turn off and check if you have achieved the softness you desire. If not, repeat until smoothness you desire is reached. Stop if the skin becomes sore or inflamed. 5. Once you feet are starting to resemble smooth, happy feet again, switch off the device. Turn the unit off by twisting the silver ring to the right. Wipe or rinse feet to remove any excess dead skin. Thoroughly dry feet. 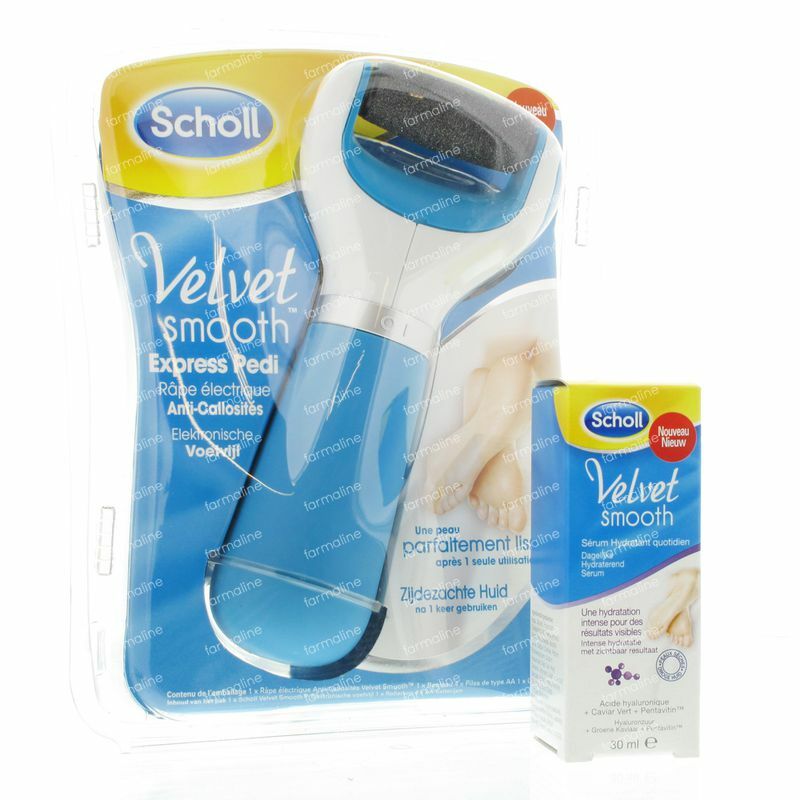 Apply Scholl Velvet Smooth Moisturiser and massage into your smooth feet. If your skin feels dry or after you have used the electric Velvet Smooth ™ Foot File, use the serum and your skin will intensely be hydrated. Because I had already bought a file for myself and I was very pleased I bought a second one as present for my daughter and daughter-in-law. They were both very happy with it.